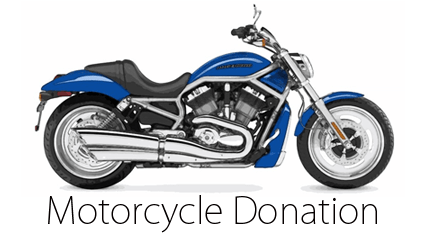 Donate Motorcycle to charity, Much easier than selling! Motorcycle donations accepted all 50 states!. Donate motorcycle and enjoy a fair market value tax deduction plus free towing anywhere in the USA. Donate bike to charity today! Is your motorcycle in pieces or past its prime? Are you riding days long behind you? Donate your motorcycle now! Donate all makes of motorcycles through our helpful team members in as little as five minutes through the form below or over the phone. Give back to charity by turning your motorcycle into proceeds and lasting results for those in need. Strengthen your community and clear up free space in the garage or on the side of your house with one quick call to us. Don’t have time to call? Complete the form below now to learn more.